For the second time in just about a calendar year the New York Yankees have acquired “The Cuban Missile” Aroldis Chapman to be their everyday closer in the Bronx. Woo hoo! The first time, for whatever reason, we did not officially introduce him to the Yankees faithful but this time I have a feeling he might be sticking around a little longer… so without further ado let’s meet Mr. Chapman again. This is Meet a Prospect: The Aroldis Chapman Edition. Albertin Aroldis Chapman de la Cruz was born on February 28, 1988 in Holguin, Cuba. Chapman had a boxing trainer for a father and two sisters in his three-room house in Cuba (rooms, not bedrooms) and as a young child Chapman was taught to box, not play baseball. When Chapman finally did begin playing baseball it was as a first baseman, not as a pitcher. It was in 2003 when a coach noticed Chapman’s arm that he was converted to the pitching mound full time. Chapman joined the Holguin Sabuesos of the Cuban National Series League in 2006 as a starting pitcher and was a part of the 2007 Pan American Games representing the Cuban national team as well as the 2009 MLB World Baseball Classic before defecting from Cuba in 2009. Chapman had tried to defect from Cuba in 2008, an act that kept him from participating in the Summer Olympics that year, but then President Raul Castro gave him a conditional reprieve. Chapman was signed by the Cincinnati Reds after declaring his citizenship in Andora to a six-year deal worth $30.25 million with bonuses worth $16.25 million paid over the next 11 years. Chapman set many records for the fastest pitches thrown for the Reds while mowing down MLB ready hitters. Chapman worked as a starter for the Reds in 2010 and even made a playoff appearance for the team before switching full time to the relief role we know him in today before the 2011 season. Chapman earned his first All-Star Game trip in 2012 as a closer for the Reds and followed that up for Cincinnati with a return trip in 2013 as well. Chapman and his blazing 100+ MPH fastballs were here to stay and nothing could stop them it seemed. Well maybe except for a line drive off the bat of Kansas City Royals star Salvador Perez. Perez hit Chapman with a line drive off the bat in a spring training game on March 19, 2014 causing a skull fracture above Chapman’s left eye and a metal plate to be inserted into his head to stabilize the fracture. Chapman began the 2014 season on the disabled list due to the fracture in his skull and did not return to the baseball diamond until May 10th of that season. Chapman’s 2014 season and 2015 seasons went off without a hitch until the left-hander was almost traded to the Los Angeles Dodgers in the winter before the 2016 season. Apparently Chapman had a domestic violence case pending against him from earlier that winter which kept the Dodgers from acquiring him. The New York Yankees came in with a lesser package of prospects and acquired the left-hander giving up Rookie Davis, Tony Renda, Caleb Cotham and Eric Jagielo. 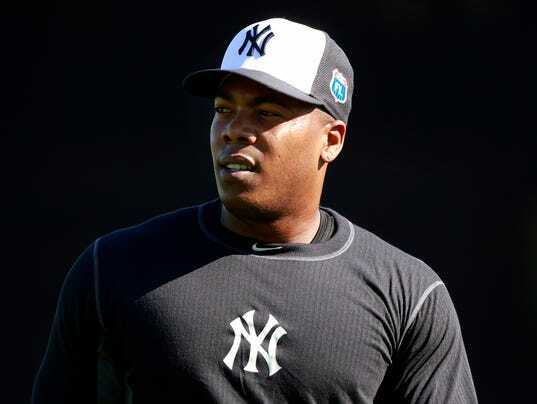 Chapman missed the first 30 games of the season due to his domestic violence incident from the offseason and by July 25th he was no longer a Yankee. The Yankees traded Chapman to the Chicago Cubs for Gleyber Torres, Billy McKinney, Adam Warren and Rashad Crawford with hopes that New York could rebuild their farm system while the Cubs could win a World Series. Success and success as the Yankees have one of, if not the, highest touted farm systems in all of Major League Baseball in 2017 due to this trade and trades like it while Aroldis Chapman helped lead the Cubs to their first World Series victory since the Curse of the Billy Goat was cast in 1908. Chapman, World Series ring on his finger, hit free agency after the 2016 season ended and has now found a home back in the Bronx. For the next five seasons Aroldis Chapman will be closing games inside of Yankee Stadium and that makes me very, very happy. Welcome back Aroldis, the family missed you!